Lack of testing requirements inhibits more thorough review of drinking water safety. Seven public drinking water sources in Ohio have been listed as “impaired” due to high levels of algae toxins.Click image to enlarge. Seven lakes, reservoirs and rivers that supply drinking water to approximately 1 million people in Ohio have repeatedly exceeded safe levels of a toxin that can cause sickness and liver damage, according to a state water quality report. The toxin, produced by algae, rendered the water undrinkable earlier this month for more than 400,000 people in the Toledo area. The drinking water sources found to contain the toxin serve seven cities including Toledo, Akron and Lima. Though these cities have largely been able to treat the water to make it safe, the water plants in Toledo and Carroll Township—a small community in Ottawa County—have both been forced to issue “Do Not Drink” advisories in the past year. In Grand Lake St. Marys, Ohio’s largest inland lake, toxin levels have been so high that people are advised not to swim in the water. The drinking water and beach warnings represent a danger to public health that has reemerged in the past decade after state, federal and international efforts largely ridded Lake Erie of toxic algae blooms in the 1980s. Treating the toxins are costing cities millions of dollars, while water shutoffs and unsightly blooms can hurt businesses from restaurants to charter boats. The findings about the growing threat to Ohio’s drinking water safety were contained in a biennial assessment of water quality conducted by the Ohio Environmental Protection Agency. The assessment was released in February but attracted little attention until August 2 when Toledo issued a “Do Not Drink” advisory due to high levels of algae toxins in its treated water. Circle of Blue reviewed the draft report this week. The assessment included algae toxins for the first time this year and listed the following drinking water sources as “impaired”, meaning levels of toxins were higher than the state’s threshold for safe drinking water at least two separate times in five years. The toxins were found in the water supplies before they were treated and used for drinking water. After being treated, the water from these sources was within safety limits. *The state safety threshold for the algae toxin, microcystin, is 1 microgram of toxin per one liter of water. The state also developed a “watch list” for drinking water sources that will be monitored for high levels of toxins in the future, and six water supplies were placed on this list in 2014. Both the watch list and the “impaired waters” list are based on data collected from 2008 through 2012, but the vast majority of public drinking water sources did not have enough data to perform a full assessment. Of the drinking water sources that were tested, Grand Lake St. Mary’s had the greatest number of water samples over the toxin limit. The samples were taken near the water supply intakes for the city of Celina, and concentrations of the toxin exceeded the state limit 110 times between 2010 and 2012. The William’s reservoir near Lima recorded the state’s highest toxin levels at 1,400 micrograms per liter in 2012. However, the William’s reservoir was placed on the watch list instead of the impaired list because the high levels were recorded just one time in a five-year period. In response to Ohio’s draft report, the United States Environmental Protection Agency asked the state to also include the open waters of Lake Erie’s western basin on its impaired list. Once a waterway is listed as impaired, the federal Clean Water Act requires the state to develop a plan for how to restore it. The plan outlines the pollutants causing the poor water quality and recommends limits for pollutant discharges, known as a Total Maximum Daily Load (TMDL). The primary pollutant that causes algae and harmful toxins is phosphorus—a nutrient found in fertilizers, manure, and wastewater. 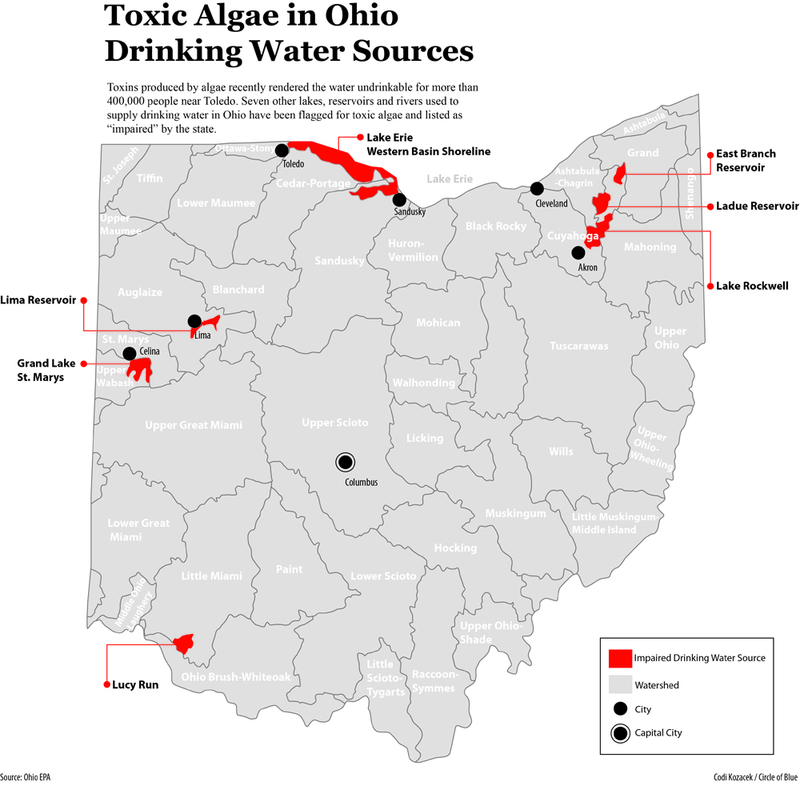 Ohio has restoration plans for two of the drinking water sources contaminated by algae—Grand Lake St. Mary’s and the Lima Reservoir. A plan for Lucy Run is scheduled to be completed in 2015, while plans for the remaining impaired public drinking water sources are expected in 2023. If Ohio listed the open waters of Lake Erie as impaired, it would be required to create a restoration plan to reduce algal blooms. However, this would apply only to the waters of the western basin under Ohio jurisdiction. Ohio EPA requested that the U.S. EPA initiate a plan for Lake Erie’s entire western basin in 2011, but this request would also need to be made by all of the other states along Lake Erie for the federal agency to create the plan. Additionally, any state could also individually list its portion of Lake Erie as impaired and create its own restoration plan for that portion. Yet even after a plan is completed and approved by the U.S. EPA, there are legal and financial hurdles that can hinder its implementation. A TMDL plan assigns “allocations” to all of the sources of a pollutant in a watershed. Point sources that are permitted under the Clean Water Act—such as a wastewater treatment plant—are allocated a certain amount of pollutant that they can release into the water. Nonpoint sources, like farms or septic systems, are also given an allocation. Allocations for point sources are required to be enforced through their permits, but allocations for nonpoint sources are not federally regulated. Instead, these allocations are “implemented by nonpoint sources through a wide variety of state, local and federal programs (which may be regulatory, non-regulatory, or incentive-based, depending on the program), as well as voluntary action by citizens,” according to the U.S. EPA website. Ohio law does not have regulations requiring nonpoint sources to implement a TMDL plan, but it does allow an impaired waterway to be declared a “distressed” watershed. This gives the state more authority to regulate manure and fertilizer applications within the watershed, such as banning manure spreading on frozen ground. Grand Lake St. Mary’s, near Columbus, is currently the only watershed in Ohio designated as distressed, but several Ohio lawmakers have asked Governor John Kasich to declare the Maumee River watershed as distressed following the Toledo water crisis. No application of manure between December 15 and March 1 without prior approval for each application. Records must be kept of manure storage volumes, and 120 days of storage must be available on December 1 of each year. No surface application of manure on frozen ground or ground covered with more than 1 inch of snow outside of the December 15 to March 1 dates. Outside those dates, manure may be applied if it is injected or incorporated within 24 hours. No surface application of manure if the local weather forecast for the land application area contains a greater than 50 percent chance of exceeding 0.5 inches of precipitation extending 24 hours after the projected start of the application of manure. Still, toxin levels in the lake are well above the state threshold for drinking water and are high enough that recreational contact with the water is discouraged. In July, toxin levels reached 95.6 parts per billion in the lake, nearly 100 times the safe drinking water limit. Environmental groups say the implementation of the distressed watershed designation could be improved. While state efforts can play a role, the best bet for restoring Lake Erie to health is the Great Lakes Water Quality Agreement, according to both the Ohio and federal EPA. The GLWQA includes the federal governments of Canada and the U.S., as well as the governments of seven Great Lakes states and one province. It has been instrumental in setting targets for pollution and coordinating efforts between the various levels of government, and is credited with leading the reduction of Lake Erie algal blooms in the 1970s and 1980s. The GLWQA has tasked both the U.S. and Canada with developing new objectives and targets for nutrient reductions in Lake Erie by 2016, according to Hyde. By 2018, each jurisdiction will develop “domestic action plans” to implement those targets. Chesapeake Bay has a TMDL and implementation plan that requires nonpoint source reductions that so far have been upheld in federal court. The failure of the distressed watershed is that there are no required annual reductions and accountability as there are under the TMDL implementaion plan and that factory farms that ahve less than the number of animals required for a permit – usually just a few – are not required to do anything even though large numbers of animals with lots of manure contribute to the problem. The Chesapeake TMDL was triggered by an executive order that required the federal agencioes in coordination with states and others to devise a plan to reduce the excess nutrients.